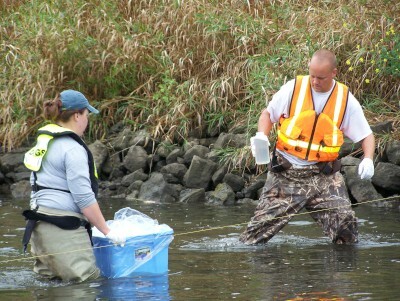 USGS hydrographers collecting a water-quality sample at the Zumbro River near Rochester, Minnesota. Photo Credit: Kathy Lee, USGS. Partnerships between the U.S. Geological Survey (USGS) and the Minnesota Department of Health (MDH) enhance the State's ability to evaluate human-health risks from chemicals of concern (CECs). 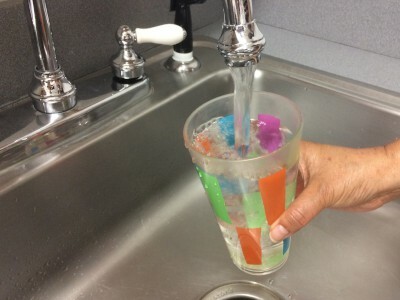 MDH considers CECs for toxicological review and development of drinking-water guidance. The human-health information generated by the MDH puts the chemical data into an environmental health context. The CECs include chemicals in products we use and consume in our daily lives such as human-use and veterinary pharmaceuticals, fragrances, surfactants, plastic components, and fire retardants. The chemicals are often called "chemicals of emerging concern" because the risk to human and environment health may not be well understood. Many CECs are produced industrially yet are dispersed to the environment from domestic uses. Collaborative studies between the USGS and multiple Federal and State partners in Minnesota have expanded the understanding of CECs presence in groundwater, streams, and lakes as well as identified potential sources. USGS and MDH scientists have worked in partnership to compile CEC environmental data collected during 1999 through 2013 as part of these collaborative studies. The MDH has used the data compilation to quickly and efficiently identify detections of CECs under review and to identify unexamined chemicals to be considered for toxicological review and development of drinking water guidance as part of their Contaminants of Emerging Concern Program. Through the program, MDH investigates and communicates human-health risk and exposure potential of CECs in drinking water. MDH takes a proactive approach to the protection of drinking water by considering contaminants that have not been found (or looked for) in Minnesota and those CECs that have been found in groundwater, surface water, or soil. Additionally, this program provides information sheets on each chemical that includes information on how people are exposed to these contaminants and potential health risks. The MDH guidance values can be used to understand the potential human-health relevance of exposure to chemicals measured in drinking water, similar to the way USEPA Maximum Contaminant Levels or USGS Health-Based Screening Levels are used. For example, USGS and Minnesota Pollution Control Agency scientists used MDH guidance values in their investigation of CECs in groundwater sampled from more than 100 wells across Minnesota to help communicate water-quality findings from their study in a human-health context. This work was funded by the Clean Water, Land, and Legacy Amendment (Minnesota Constitution, Article 11, Section 15) and the USGS Cooperative Water Program. For more information contact Sarah M. Elliott, USGS Minnesota Water Science Center, or Helen Goeden and Christopher Greene, MDH.